No area of public policy and law has seen more change than lesbian, gay, bi-sexual, and trans-gender rights, and none so greatly needs careful comparative analysis. 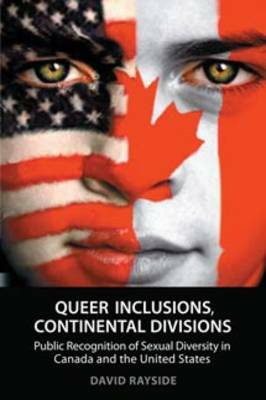 Queer Inclusions, Continental Divisions explores the politics of sexual diversity in Canada and the United States by analyzing three contentious areas - relationship recognition, parenting, and schooling. It enters into long-standing debates over Canadian-American contrasts while paying close attention to regional differences. David Rayside's examination of change over time in the public recognition of sexual minorities is based on his long experience with the analysis of trends, as well as on a wide-ranging search of media, legal, and social science accounts of developments across Canada and the United States. Rayside points to a 'take off' pattern in Canadian policy change on relationship recognition and parenting, but not in schooling. At the same time, he explores the reasons for a 'pioneering' pattern in early gains by American LGBT activists, a surprising number of court wins by American lesbian and gay parents, and changes in American schooling that, while still modest, are more substantial than those instituted by the Canadian system. Queer Inclusions, Continental Divisions is a timely examination of controversial policy areas in North America and a reasoned judgment on the progress of lesbian and gay issues in our time.